VIRAMAR offers expansive exterior lounge and dining areas combined with a spacious and comfortable interior. She has a fabulous flybridge offering a 360 degree view of the Caribbean, a forward cockpit for cocktails plus there’s a large aft cockpit for lounging and alfresco dining. 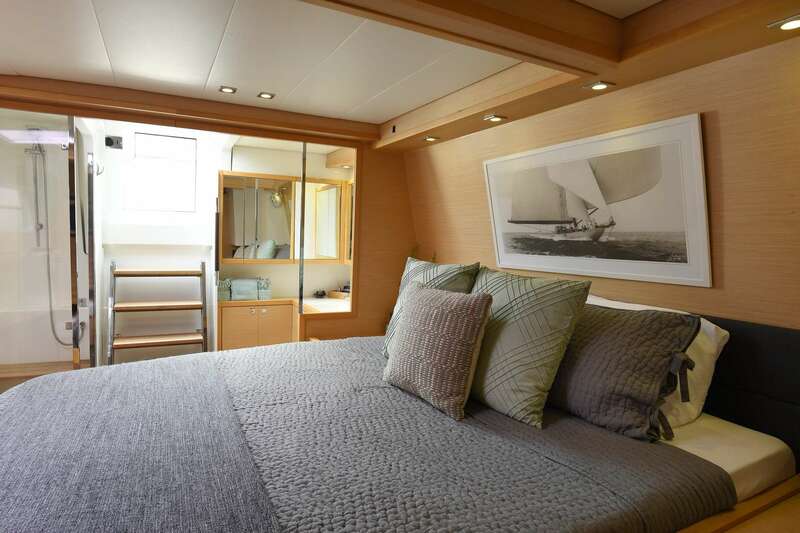 There are 4 queen cabins each with a private en-suite bath with electric toilet and stall shower. 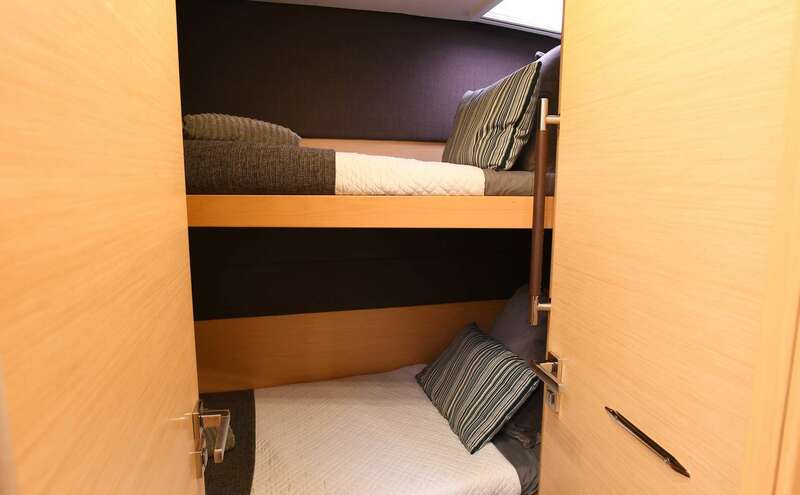 In addition there is one twin bunk cabin with a private bath, electric head and stall shower. Port aft queen is crew cabin. 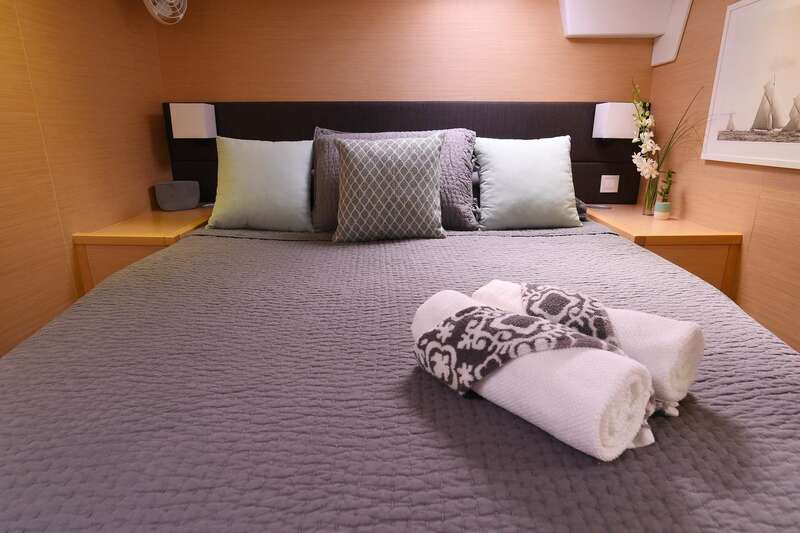 3 queen cabins plus 1 cabin with a set of twin bunk beds available for guest use. 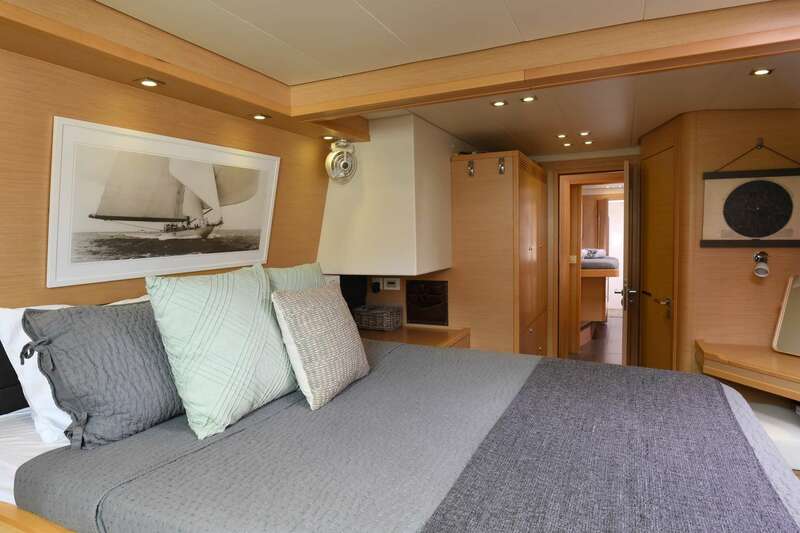 Each queen cabin has an en-suite bathroom with electric head and dry shower stall. Twin bunk has an en-suite bathroom with electric head and dry stall shower stall. All guest cabins entered from salon/galley. Crew cabin is port aft queen. Tyler and Erika love being on, in or under the water. Committed to exceptional guest service, this crew will make sure your vacation in the islands is one you will never forget. Tyler and Erika meet in college where they worked at a dive shop and ran a dive club together. After college they set off to face the corporate world - Tyler as a production manager for Aramark Uniform Services and Erika as a logistics manager for Target. Hectic travel schedules and long days left them missing each other and the water. After years of climbing the ladder, they realized that there was no monetary amount or level of success that could match the time they were missing with each other. So they decided to get married and move to the islands where they could claim back the missing time and build their lives as newlyweds. 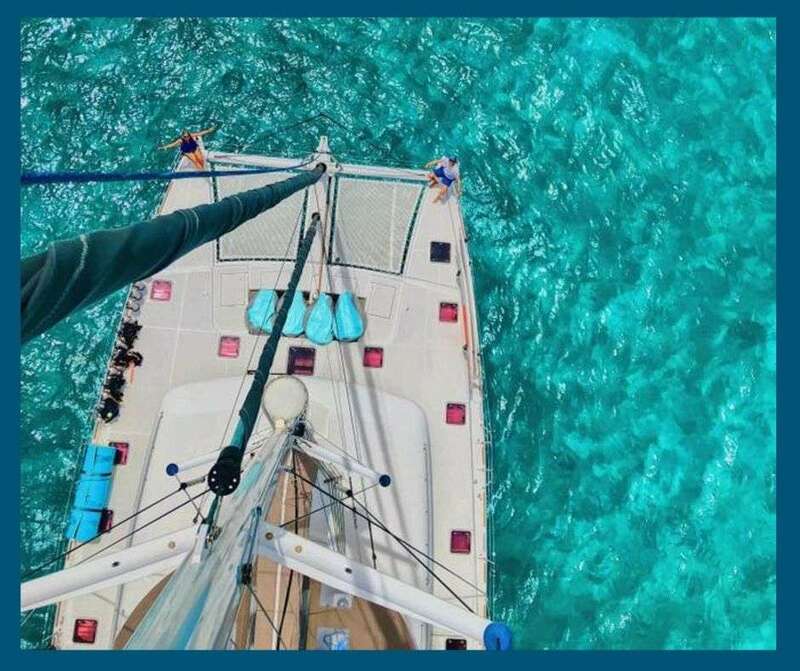 Island life suited them as they enjoyed sailing, diving and exploring the BVI and USVI. 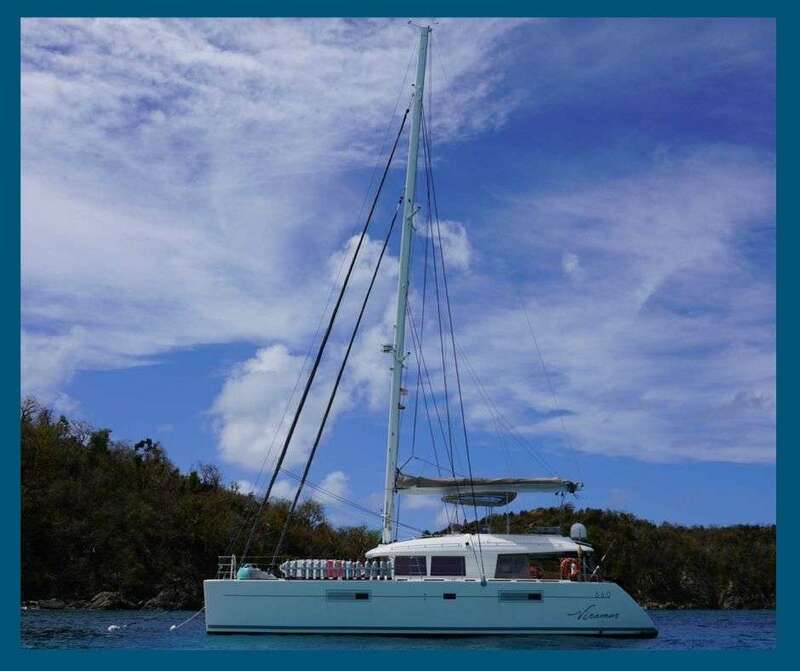 After being land-based in the BVI, working at a local dive shop, they decided move into chartering. Tyler and Erika love living and working full-time on the water. 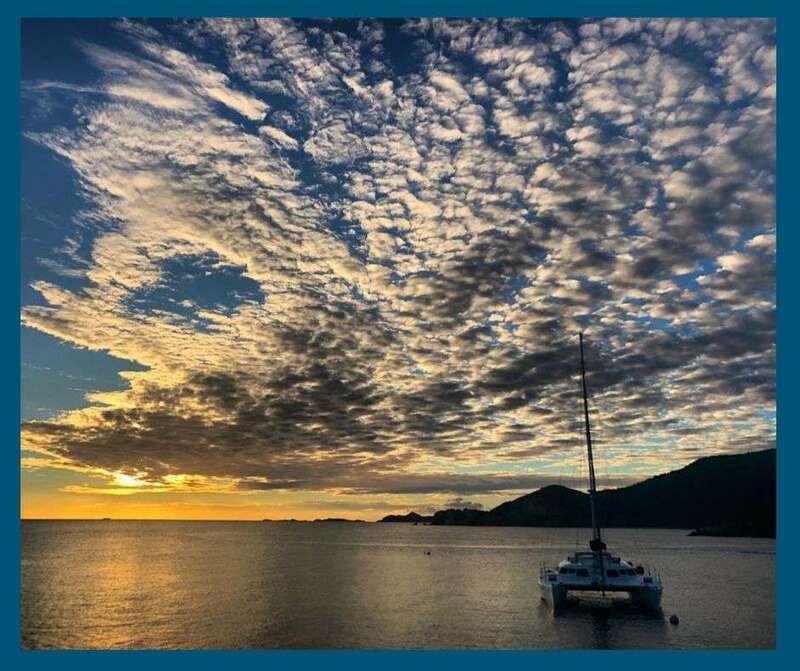 For Tyler, it’s the perfect platform to share his passion for the water by helping guests enjoy snorkeling or diving, water sports, fishing and sailing. Erika loves being able to help craft custom itineraries while providing delicious dining experiences to accompany the perfect vacation. Both Tyler and Erika are scuba instructors and instructors for first aid and CPR. Tyler is a certified Red Cross Lifeguard. Both of them have taught swim lessons as well. Their strong background in water safety makes them capable of providing an extra level of security to all of their guests. 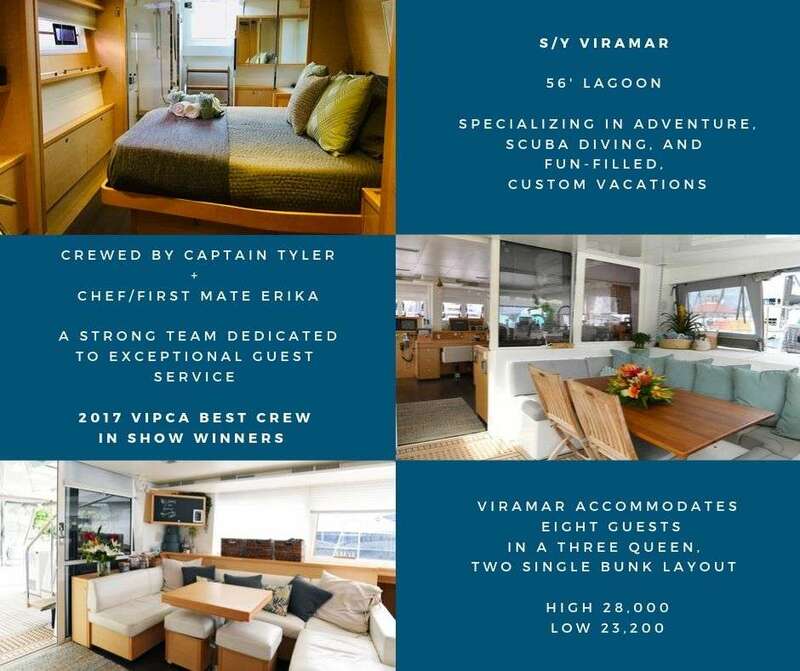 They were voted “Best Crew in Show” in their category at the VI Professional Charter Association’s 2017 USVI Charter Yacht Show. Combined, their southern hospitality and love for fun will ensure your vacation here in the islands is full of unforgettable memories. Captain Tyler: Tyler is always on the move and ready for an adventure, he is a man of many hobbies and easily relates to others. He grew up fishing, boating, wake-boarding and water-skiing. When he was ten he sailed for the first time and he quickly became hooked. In college he worked a wind surfing and scuba instructor. His passion for being on the water followed him to the East Coast where he owned his own fishing boat and served as a first mate/instructor on several dive boats. Tyler has always been an out-doorsman whether it’s hunting or backpacking in the mountains of North Carolina, where he calls home, cave diving in North Florida or free diving in the Keys. He satisfies his land-based tendencies by hiking around on the islands and finding the best jumping spots to plunge into the ocean. On the water, he enjoys throwing out a line or diving for lobsters in the USVI. In the water, he is an avid free diver and exceptional at fish identification. He is no stranger to hospitality. Tyler has years of experience in guest service management and is even a licensed bartender. As your captain, Tyler will make sure you have a fun, safe time on Viramar. He is dedicated to helping his guests create unique memories. Tyler will work with you to make sure your trip is full of destinations and adventures that fulfill your island vacation bucket list. Chef/First Mate Erika: Erika has a love for entertaining which she demonstrates by pouring custom cocktails and whipping up creative eats. When Tyler and Erika decided to get into chartering, she went back to school to earn her professional chef certification through Roubex Cooking School. She is also a certified food safety manager by the National Registry of Food Safety Professionals and a licensed bartender. She worked in event planning for three years and coordinated trips for groups as large as 40. She has helped plan pig picking, oyster roasts and even a couple weddings. She became the ultimate trip host – making sure her guests were not only organized, but also entertained and well-fed. Her background in logistics and experience in food prep helps her when it comes to planing meals for guests during their stay. She is comfortable working around dietary restrictions and flexible to meet your needs. Erika is also a scuba instructor and loves to lead underwater excursions when she is not in the galley. She is easily excited by turtles and squids - you can often find her on dolphin patrol or chasing a stingray during a snorkel. Her favorite part of any island has to be the goats, which she will happily show you on island tour days. She enjoys fishing with Tyler and anything involving being outdoors. Erika also enjoys writing, taking photos, reading and playing guitar. She is always down for a good time, new adventure or anything involving wonderful food. Tyler is a NAUI Course Director, SSI and TDI Scuba Instructor. Erika is also a NAUI Scuba Instructor. 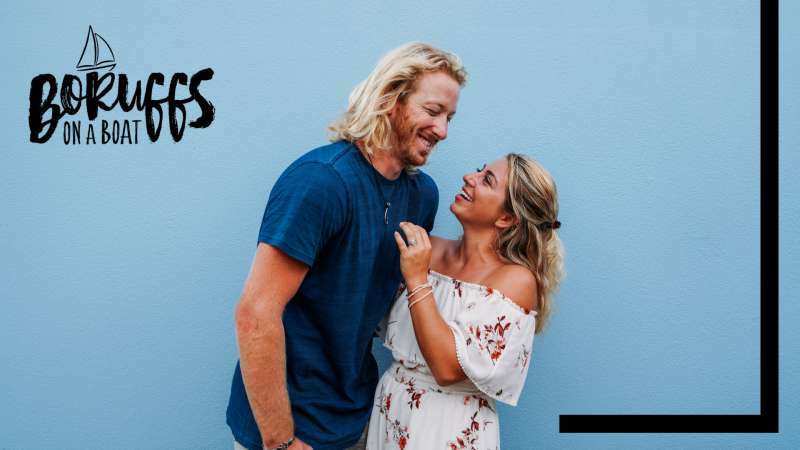 They both are avid divers with a passion to grow the sport and share their love of the ocean. Whether you are already certified or just coming to try it out, scuba diving will enhance your vacation and maximize your in-water time. The Virgin Islands are home to many beautiful reef dives and several interesting wreck dives. Tyler and Erika have extensive knowledge of the USVI and BVI dive sites including the spots not often frequented. Divers can expect warm waters year round with visibility often more than 60 feet. 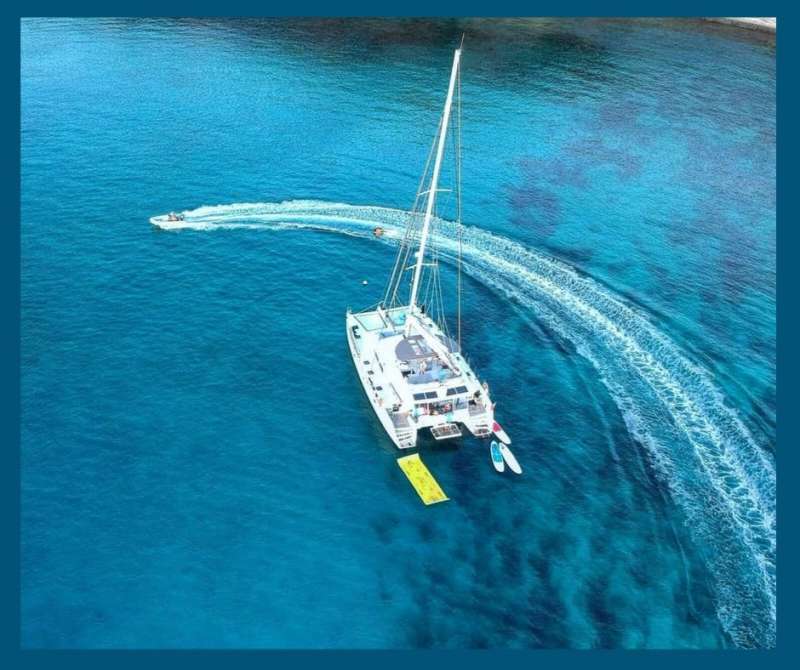 On Viramar, we dive directly from our boat and offer a large swim platform for easy access in and out of the water. Each dive, the crew will assemble your gear, guide your dive and help assist your entrance and exit from the water. Committed to your safety, there is an Emergency Oxygen Kit onboard and both Tyler and Erika are trained in O2 Administration, First Aid and CPR procedures.